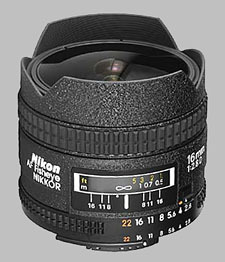 (From Nikon lens literature) Full frame 180 degree fisheye coverage with Nikon's advanced D-type autofocus lens technology. Bright f/2.8 aperture for photographing in dim light or with fast shutter speeds. High-contrast images even at full aperture. Lens Hood: Built-in flower type. Rear bayonet filters included: L37C, A2, B2, O56. I didn't like this lens on D2x. The definition is not enough for a print photo. But with my D700 the 16mm fisheye is fantastic! I don't see any cromatic aberration, nor flare (and the flare's critic in a lot of conditions), and the definition is high from f4. I bought my sample very used, but I haven't any problem with AF or other feature. I'm shooting with this Fisheye more than I thought. I really like the modest fisheye FUNK this lens gives when mounted on a 1.5x sensor DSLR. All of my lens test/comparisons were performed on a Nikon D2x (reduced frame, 1.5x 12.2MP CMOS sensor). The camera was set to mirror lock-up, mounted on a tripod and fired with the MC-30 cable release. The test exposures were captured as NEF raw files and compared with no image sharpening. When I first bought this lens I was using a film SLR, so naturally I found the 180 degree diagonal field of view quirky. However, I’ve gone on to buy a few reduced frame DSLRs. Initially, I only used the fisheye on a reduce frame DSLR a few times, because I felt as though it was like using a wide angle lens without aspherical lens elements to correct barrel distortion. Basically I felt like the 16mm fisheye lens produced sloppy wide angle results when mounted on a DSLR. At the time this deterred me. More recently I thought about selling the lens, but in a last ditched effort I took it along to photograph some live music. I didn’t end up selling this lens, because I now really appreciate the subtle curvature at the edges of the frame. In fact I now find fully blown fisheye lenses kind of grotesque. Add to this the fact that it’s wide, fast and light to travel with. Viewed in these terms, I now see the 16mm fisheye as a great quality and versatile wide-angle lens. The best results arrive with this lens set to around f/5.6. Even wide open (f/2.8) this lens performs better than the AF-S DX Zoom-Nikkor 12-24mm f/4G at 12mm OR 15mm when it’s set to f/4. Likewise on a reduced frame SLR I find the chromatic aberrations to be less pronounced on the 16mm fisheye, than those produced by the 12-24mm DX lens. Note: these are subjective results that may not reflect your particular sample OR use of this lens.